Show off your sales, promotions, and prices today! Pocket label holders attach to the end of a scanning hook. These slatwall accessories can hold price or special promotions. Label holder is designed to simply slide in on the side so labels and signs do not slip out the bottom. 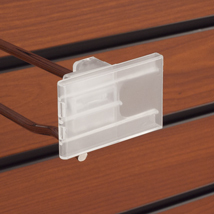 For additional items, we encourage you to take the opportunity to check out our complete collection of peg hooks for slatwall at Specialty Store Services now.